creative savv: Who wants a free Magic Bullet? Who wants a free Magic Bullet? Okay, I can not be the only one who has chanced upon a late night infommercial. My daughters will on occasion watch one on a Saturday morning. (My son has far too much sense to stop and watch an infommercial.) My girls are enthralled with the Magic Bullet. And yes, I've thought how nice and tidy it would be, to blend up everything in the same little jar as you might store or use the stuff in. Last week I was on Livingonadime.com, and the post was about helpful household tips. 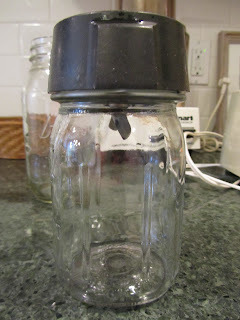 One tip was to replace the blender jar on your blender with a canning jar. I'd read this before, a few years ago. 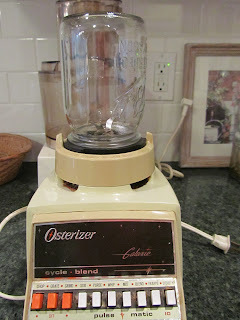 I also had a little plastic, screw-on jar that had come with my blender, 31 years ago. That little jar got lost in a move or tossed in a de-cluttering effort, and I couldn't find it, even after a very thorough search of the cupboards. I've been making my own sunflower seed butter for several months now, and thought how convenient this little jar would make the process. Then I read the tip again on Living on a dime, and set to try it out with the sunseed butter. I got a canning jar out, took the blender jar off the blade assembly. 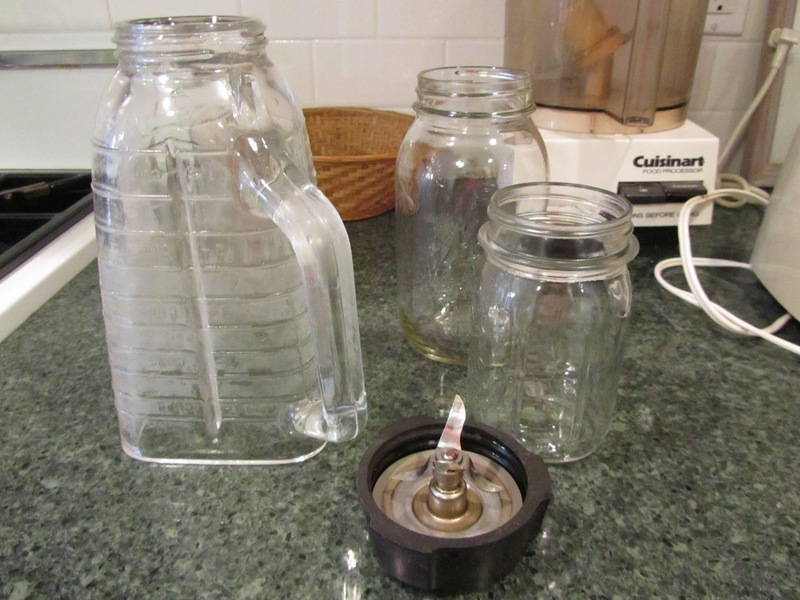 Then screwed the blade assembly onto my canning jar, and one of my daughters exclaimed, "it's a Magic Bullet!" Really, the excitement in the house that afternoon was incredible, just over this one little thing (we're easily amused, excited and entertained at this end of the world). So, after twisting the blade assembly back off the canning jar, I dumped my warm sunflower seeds into it, along with the oil and brown sugar, put the blade back on and proceeded to make my week's sunseed butter. 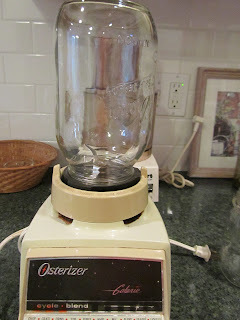 And yes, this one little trick really did simplify my seed butter making process. When the seeds were all ground into sunseed butter, I took the blade assembly off the canning jar, and capped the jar with a canning lid. All that was left to clean was the blade assembly. So I started thinking, wouldn't this be cool for smoothies. Everybody gets to choose their ingredients to put in their own pint-sized canning jars, then take turns with the blade assembly portion. And the smoothies can be drunk straight out of the canning jar. Just like the Magic Bullet! Sure I don't have those fancy colored drinking caps that fit on top of the real Magic Bullet jars, but still I think a pretty cool idea. Everyone gets their own custom smoothie! This will also be great for homemade salad dressings and sauces that need blending, then storing in the fridge. Like a jar of homemade ranch-style dressing, made with fresh herbs from the garden. Or a jar of barbeque sauce, or even homemade mayonnaise. Process in the same jar as storing. Anyways, if you want to try this yourself, here are the detailed instructions. Here's a standard blender jar. 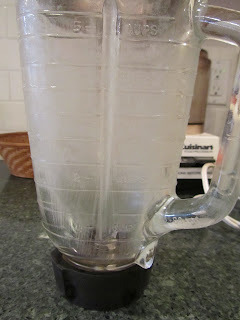 The blade assembly is attached to the bottom of the blender jar and removes for easy cleaning. It consists of the blade base (the black part), the blade itself, and a rubber gasket to ensure a good seal. Fill a pint or quart, narrow-necked, standard canning jar no more than 2/3 full with ingredients to be processed. Turn your blender jar upside down, unscrew and remove the blade assembly. Fit this onto your filled, standard canning jar. Screw the entire blade assembly onto the jar, including the assembly base (the black cap-like part), blade and rubber gasket. After screwing the blade assembly onto the jar, turn upside down and fit onto blender base and process. 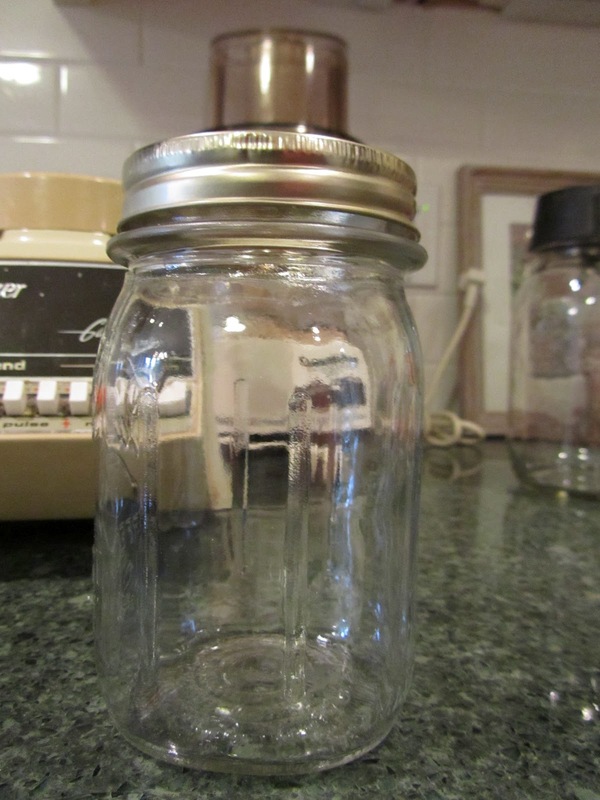 Hold onto the glass jar as it is processing, to prevent the jar from unscrewing mid-process. Use a quart-sized jar for amounts greater than 2 1/2 to 3 cups, so the contents have room to move about when blending. 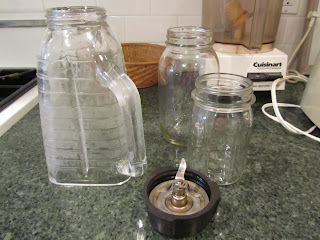 Pop a canning lid on your mixture in the canning jar, and store. Voila! Your very own Magic Bullet for free! I'm not sure of all the manufacturers' blenders, as to whether or not their blades will fit your canning jars. But I know that this does work with my Osterizer. I have the EXACT same blender as you! (hand-me-down from my husband's ex-landlady) I can't wait to try this idea. Also, I have to tell you that I've been trying to make yoghurt without an electric machine for two years and failed (I always got the stringy stuff you described) - but I tried with yours and it worked. I think it was a combination of the correct starter (I used Danone) and strictly following the temperatures. So far, I've made two new batches off the first one successfully. I'm so glad you had success with the yogurt. And I think you're right, it's a combination of the right starter and following the temperature requirements exactly. In looking back, when I tried so many years ago, I just used cheap yogurt for starter and didn't control the temperature at all. It feels so great to finally get it right, doesn't it?! Thanks for letting me know that it worked for you.